Are you challenged by asynchronous behavior, digital interfaces, data exchange protocols and APIs? Explore how Coronys Platform makes testing of your real-time system possible. Are you challenged by asynchronous behavior, digital interfaces, data exchange protocols and APIs instead of visual UI? Automate direct communication with your embedded. Designed to easily grow from testing of the stand-alone modules to the verification of your entire system over distributed architectures. One platform encompassing the real-time analysis of communication transactions, ATE and IO boxes control, SQL querying and UI test automation. 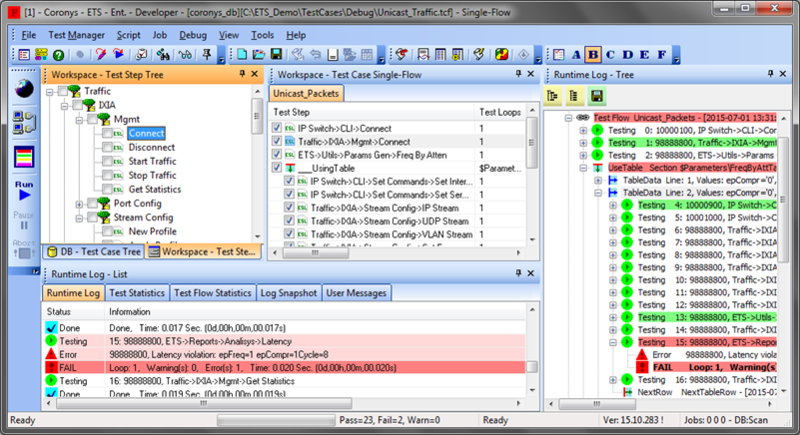 Reacts in run-time on specific data in communication messages, packet arrival, Telnet disconnection, software timers expiration and other multiple asynchronous alerts. Launches your tests on multiple remote machines at once or in sequence. Allows coordinated execution of test tasks and load balancing between setups. The Free Edition is perfect for small automation projects and features exploring. Copyright © 2002-2017 Coronys Ltd. All Rights Reserved.